Dramatic words or violent acts were not how the Ukrainian people ousted an authoritarian leader and his cronies. Civil resistance shredded the legitimacy of a repressive and corrupt government. The nonviolent movement dissolved the consent of the people and the loyalty of regime defenders on which Victor Yanukovych depended. On February 25, Reuters News declared that “a 26-year-old who learned combat skills in the army cadets may be recorded as the man who made up Viktor Yanukovich's mind to cut and run.” The young man had taken the microphone at a rally in Kyiv, denounced Ukrainian politicians for shaking hands “with this killer,” when they signed a deal with Yanukovych earlier that day, and demanded that “tomorrow, by 10 o’clock, he has to be gone” - which some took to be a death threat. As always, the news media were engorged with scenes of barricades and burning tyres. But while violence was eye candy for the television networks, it was the exception and not the rule in the 88-day struggle that placed Ukraine back on the road to genuine democracy. From the start of the protests in Kyiv on November 24, 2013 until the day Yanukovych fled the capital on February 21, 2014, Ukrainians were continually using an impressive array of nonviolent tactics that brought the government to its knees. Protesters discuss current affairs in the Maidan, Kiev. Demotix/Maxim Golubchikov. All rights reserved. Three days after the government announced on November 21 that it was cancelling a pending agreement for the nation to become affiliated to the European Union – provoking a huge public backlash – 100,000 Ukrainians marched across Kyiv carrying European flags, and a mass occupation of “the Maidan,” the central square in the capital city, commenced. The “maidan,” as the nonstop protest was itself called, consisted of several thousand regular campers and tens and then hundreds of thousands of standing and sitting civilians who joined it for major demonstrations or on the weekends. During three months of resistance, Ukrainians created a genuinely deliberative and self-organized political community in the open winter air. The Open University of Maidan offered hundreds of lectures and discussion forums throughout the occupation in order to inform and educate people. Lawyers launched the initiative “Euromaidan SOS” that extended legal and financial aid to detained activists. Many people came and offered money, food, clothes, blankets and tents. Medical facilities - some with equipment that local hospitals could envy - and food kitchens with hundreds of volunteers sprang up across the site. Music was heard often on the Maidan. One of the songs “Vitya Ciao” (or Goodbye Victor, a clear reference to Victor Yanukovych) was posted on YouTube at the beginning of December, went viral and gathered close to one million views. In Kyiv hundreds of people would stop to sing the national anthem, which was also repeatedly heard on the Maidan. Handicapped protesters went on the streets and online with signs that read, “Are you going to shoot us too?” in reference to the police violence that led to the death of activists in January. 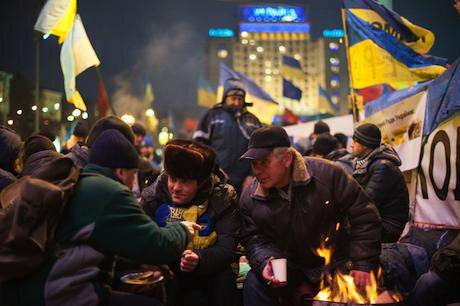 Maidan was a beacon, but its light was reflected by many others elsewhere in the country. By the end of January, the protests had appeared in a number of cities even in the eastern part of the country. They attracted students, intellectuals, professionals, working class people, atheists, Catholics, Orthodox Christians, and Jews. - In Odessa in the south (the city that was considered a Yanukovych stronghold), there were a number of demonstrations, including one in which thousands of people carried a flag of Ukraine that was half a kilometre long. - The “falling Lenin” campaign, which symbolized the end of an outdated ruler, spanned the entire country. As the occupation became a fact of daily life and the centre of reference for opposition to a president who had plainly lost public faith, resisters further broadened their tactics. A boycott was begun of products and companies owned by or known to have close business ties to the oligarchs who supported Yanukovych and members of the parliament from his political party. The organizers targeted more than 200 businesses all over Ukraine including banks, restaurants, hotels, shopping malls, car dealerships, online and print media, alcohol products, and dairy companies. Some companies repackaged their products without brand names, to try to lure back buyers. The main boycott’s Facebook group had more than 57,000 members. The struggle quickly transcended the original issue – Yanukovych’s rejection of Europe – that had initially angered the public. It was not primarily framed by rivalry between the east and west of the country, but by whether Ukraine would be open and progressive, or a relatively closed and corrupt domain run for the benefit of a self-serving elite. In fact, the initial goal of the protesters to pressure Yanukovych into signing the association agreement with the EU represented a profound rejection of a future in which the country seemed headed for stagnation. 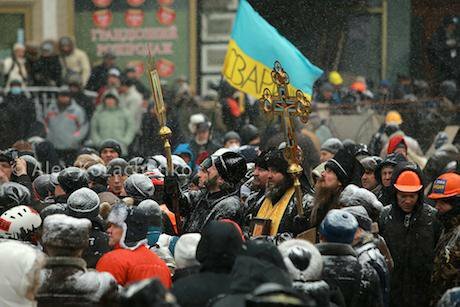 It is not uncommon for mass nonviolent movements to provoke the public to re-examine their very identity, and it happened this winter in Ukraine. Protestors in the Maidan. Photo: Alex Kozachenko. All rights reserved. In the early morning of November 30, police officers swinging truncheons and spraying tear gas cleared out the Maidan. Furious at the brutality, thousands more poured into the square calling for Yanukovych’s resignation. In broaching the use of violence, the government soon found that that would only quicken the movement, because ordinary people were disturbed by seeing people just like themselves being beaten up without having posed any physical threat. The state’s violence was automatically disproportionate to anything they faced, so long as the people’s tactics were always nonviolent. The muscle of the developing movement became obvious on December 14 when two large but different masses of people occupied public squares less than a quarter of a mile apart in Kyiv. One was the mammoth anti-government assembly that had staked its ground the month before, and the other was a smaller rally in support of the embattled president. One was becoming a movement, and the other was not. On January 16, the government dug its eventual grave a little deeper. The Ukraine parliament passed sweeping anti-protest laws, which included heavy fines on those who set up tents, stages or amplifiers on public property. Three days later, with confrontations between protesters and police becoming more frequent, the first Molotov cocktails were thrown and a police truck was set on fire. Some of the perpetrators were young radical activists from the Right Sector. Three days after that, the first protesters died from the use of live ammunition. Becoming uneasy about how all this would end, the parliament repealed the anti-protest laws, and Yanukovych dismissed his prime minister. But only three days later, a protest leader was kidnapped and tortured. Self-generated violence was coming from groups on both sides. While the rising violence diminished civilian participation in protests – a common occurrence in predominantly nonviolent struggles – it still generated “backfire” against the Yanukovych regime. Highly mechanized divisions of interior security troops going against radical-flank activists equipped with medieval-era weaponry were still seen as using excessive force. In fact, most if not all the protesters who were shot and killed or beaten to death during the conflict in Ukraine had no lethal weapons. The number of casualties in the movement was more than ten times higher than that of the police. Civilians’ use of social media ensured that videos were widely seen, showing the killings of protesters who were equipped only with shields easily pierced by live ammunition. Public outrage about shootings of unarmed demonstrators grew with each incident. Remarkably, in the midst of this turmoil, nonviolent resistance became more imaginative. On February 20-21, people placed themselves on railway tracks and blocked a train with 500 interior security troops headed to Kyiv. The troops were forced to disembark and forced to return to the barracks, never reaching their original destination. People in other cities and towns along the major highway in Ukraine set up blockades and stopped buses carrying government-paid thugs (titushki), preventing hundreds of them from reaching the capital. Some taxi drivers in Kyiv were known to offer a pick-up for unsuspecting groups of thugs that came from outside of Kyiv only to find themselves driven right into the center of the Maidan and handed over to the civil resisters. Residents also set up neighbourhood watch groups in order to neutralize and contain the thugs. With a militant spirit in the air, protesters resorted to more disruptive but still nonviolent actions by seizing and occupying government buildings in Kyiv and elsewhere in the regions. This tactic proved to be troublesome for the authorities because it was difficult to recapture the buildings that became well-barricaded without committing significant manpower. At the same time, the occupation of central government buildings by activists was sending a powerful message that the government was losing control. Perceptions can sometimes precipitate reality. The automaidan or the Ukrainian car movement that at its peak consisted of more than 1,000 cars, aided communications, violence prevention and de-radicalization. It often served as the ears and eyes of the Maidan, to learn about the movement of security forces and government thugs. It was used a number of times to block the entrances to the sites of the interior security forces that hindered the latter’s deployment. It led the blockade of the presidential residence in Mezhyhirya, just outside of Kyiv which greatly upset Yanukovych. It also protected hospitals where wounded activists were taken for treatment against police and thugs. And it patrolled the capital and other cities to block marauding titushka, bringing them to the Maidan where they were publically re-educated, shamed and eventually released with the promise that they would return home – which most of them did. These disruptive nonviolent tactics were so effective that the regime came down hard on the automaidan, whose members were regularly stopped by the police, having their cars burned, vandalized or confiscated. If violence by the regime and the titushka backfired on the government, violence by armed opponents of the regime – a phenomenon in civil resistance called “radical flanks” – did not, on balance, significantly hurt it. Although a small radical flank - represented by some self-defense units and the Right Sector on the Maidan - might have played a tactical role in defending the square on one occasion, these groups were not necessarily effective in shielding the Maidan from regime provocateurs. For example, the march on Verkhovna Rada on February 18 led by some radical elements in the movement was considered a strategic mistake that left the Maidan vulnerable to police attacks. When the regime agreed to engage in negotiations in the second half of January after violence flared up on both sides of the barricades, this was hailed by some activists as a clear victory for radicals. But it is now known that Yanukovych did not negotiate in good faith and used the truce to prepare for a violent crackdown in February. Ironically, the heroic moment of maidan radicals in the eyes of the public may have been a function of their restraint, not their violence. There was a significant degree of discipline on the part of radicals, whose maidan self-defense units often guarded policemen and thugs who had been captured. They were shamed by parading them in public, but at the end of the day their safety had been assured. Likewise, in some crucial moments during the struggle in Kyiv, even the leader of the Right Sector, Dmytro Yarosh, showed a sense of limits. He issued one of the most important declarations on February 9 where he called for decisive action against the regime that had failed to release all political prisoners as promised and drop their criminal charges. This meant the end of an informal truce between the government and the opposition that had been in effect since the end of January. In the declaration one looks in vain for a call to arms or threats of physical violence. Instead, the most radical action enjoined was to… block government buildings. The larger irony about violence in Ukraine was not supplied by riotous movement hitchhikers but by the hyperbolic media coverage devoted to them. It raised unplanned but frightening street fights to the apparent level of grand strategy, which they were not. On January 24, Fox News breathlessly reported that, “huge fireballs lit up the night sky in central Kiev and plumes of thick black smoke rose from burning tires at giant barricades erected by protesters…Clashes resumed at the barricades, which are just yards from lines of riot police and…angry demonstrators hurled firebombs, rocks and fireworks at officers.” All of this happened, but none of it determined the conflict’s outcome. In most instances, violent radicals in Ukraine were less impressive than the armed wings of other movements, such as the African National Congress (ANC) in its resistance in the 1980s to the apartheid regime in South Africa. But in that conflict as well as in Ukraine, the radical flank mainly used an “iconography of violence” (a term coined by ANC veteran Howard Barrell) to boost morale and enhance the heroism of radicals, more than it resorted to serious military planning or armed engagements. Eventually, what politically wounded Yanukovych was not the physical blows of radicals throwing Molotov cocktails, but 88 days of painstaking civilian mobilizing that persistently kept the regime off balance. The movement ensured backfire every time the state resorted to serious repression. It enlarged its public base, put the regime in positions to delegitimize itself, and ultimately spurred defections of the regime’s enforcers and supporters. This happened not as a result of limited violence used by some protesters, but because the movement made it impossible for the government to demonstrate that it retained the consent of the people. 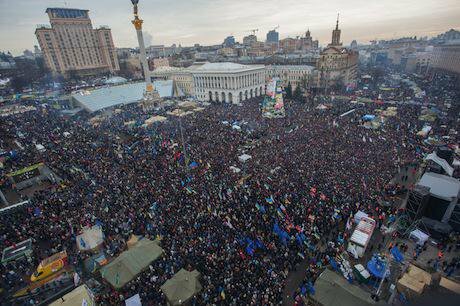 A overview on the protesters in the Maidan. Demotix/Maxim Golubchikov. All rights reserved. Defections from the Yanukovych administration, including the diplomatic corps, as well as from the police and from his ruling party, began after the regime used brutal force against the peaceful students on November 30. Yanukovych’s own chief of staff submitted his resignation immediately after that attack (a resignation that was not accepted) and then resigned again after his boss signed the anti-democratic laws on January 17. A number of mayors and governors all over Ukraine voluntarily resigned or were forced to resign by the people. Repeatedly protesters called on local security forces and the army to declare in public whether they were with the people. In December, retired Berkut officers and veterans called on their serving colleagues to act according to the Constitution and not use violence against demonstrators. Some Berkut police – particularly from western Ukraine – refused to follow the orders of their superiors at the interior ministry. Others in Kyiv came out carrying signs that Yanukovych was no longer their president. In one publicized instance, a young man who served in Berkut defected because, as he explained, he did not want to shoot his father who was on maidan. Local business leaders refused to pay taxes to the government arguing that their money should not be used to pay for thugs or police repression. Even in the stronghold of the Party of Regions – Dnipropetrovsk – two businessmen rebelled and allowed the uncensored news of their defection to be broadcast on local TV stations. In the final days of Yanukovych in Kyiv, thirty-six members of his ruling Party of Regions (a number that grew to seventy) decided to defect and join the parliamentary opposition in Verkhovna Rada, to vote for the law that ordered the withdrawal of security forces from the streets of Kyiv and their return to garrisons. Yanukovych could no longer rely on an obedient majority in parliament. On the same day, Yanukovych’s main henchman, Vitaliy Zakharchenko, the minister of interior fled to Belarus, and was joined by Yanukovych’s personal banker, Sergey Kurchenko. Their departures seem to have been hastened by a more serious defection: that of the Ukrainian army. During three months of civil resistance, Yanukovych had tried desperately to ensure the loyalty of the armed forces. He reportedly asked Ukrainian army officers to sign loyalty oaths to him, and anyone who refused was fired or reassigned. But in the end, loyalty oaths were not worth the paper they were written on. When generals refused to carry out Yanukovych’s orders, he demoted and reassigned the chairman of the joint chiefs of staff on February 19 and appointed a new chairman – a navy general - considered to be loyal to the regime. On February 20, the admiral ordered an immediate mobilization of four elite army brigades (two airborne and two navy) – all in all 2,500-3,000 soldiers stationed in the southeastern parts of Ukraine, and their immediate dispatch to Kyiv. On the same day the orders were issued, the deputy chairman of the joint chief of staff resigned in protest against the regime’s attempts to get the armed forces involved in the domestic conflict. Eventually, only one brigade of 500 troops left their location in Dnipropetrovsk on the day the orders came but the train that carried them was stopped by activists. They later blocked the roads to fend off another attempt to transport the same troops, this time by buses. Other brigades remained in their barracks. Once the parliament enacted the law to withdraw interior security forces from Kyiv in the late evening of February 20, the officers commanding the brigades used it to justify their decisions not to move their troops to Kyiv. It became obvious that Yanukovych had lost the means to put down the movement. Between February 18 and 20, almost 100 protesters were killed on the Maidan in Kyiv. With mayhem ensuing on February 19 as Berkut police and other interior security forces swarmed the capital, the government declared an all-out “anti-terrorist” operation against the demonstrators. The next day, however, the government began to crumble with increasing defections, and in the evening of February 21, Yanukovych fled Kyiv. In terms of the fundamental dynamic of how civil resistance can shred the legitimacy of an abusive government and then induce defections from its own enforcers and supporters, there is no serious discrepancy between the narrative of the collapse of the power of Victor Yanukoyvch in 2014 and the fall of Ferdinand Marcos in the Philippines in 1986, Gen. Augusto Pinochet in Chile in 1988, the communist politburo in Czechoslovakia in 1989, Suharto in Indonesia in 1998, Milosevic in Serbia in 2000, or Mubarak in Egypt in 2011. These regimes were very different, much less the societies in which successful civil resistance was organized and mobilized. But the forces that took the form of nonviolent movements in these countries and the action they took were similar: an eclectic but united political coalition, growing and persistent numbers of ordinary people participating in coordinated tactics, challenging the regime’s legitimacy, capitalizing on the backfire from repression to accelerate the momentum of events, and spurring defections from the military and other leaders, even among those who were loyal almost to the end. In most successful nonviolent struggles, three kinds of violence at the tactical level can complicate the plans of the movement: free rider violence by bands of bellicose sympathizers, street violence by self-mobilized radicals, or organized radical flanks trying to embellish the narrative of a revolution they could then claim to have partly led. Two dangers are posed by undisciplined violent groups: violence in public space diminishes participation by the broader public and can therefore sap the force of a movement, and violence targeting regime defenders can annul the possibility of defections, without which few movements succeed against repressive governments. These effects were averted in Ukraine, because the claim of the movement that had taken shape in the Maidan last November - that it represented the authentic will of the Ukrainian people - could not be forgotten or dismissed by most onlookers. With that credibility and its resilience intact, the movement in Ukraine was not undermined by violent intruders before it succeeded in its primary mission: dissolving the consent of the people and the loyalty of regime defenders on which the authority and capacity of Victor Yanukovych to remain in power depended.